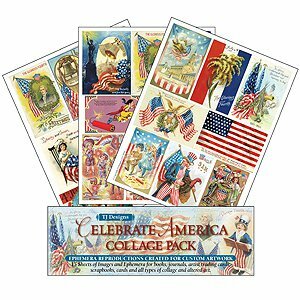 This 15 page collage pack includes authentic reproductions of vintage patriotic and 4th of July Greeting Cards and Post Cards by Ellen Clapsaddle and many other illustrators, dating back to the early 1900s. 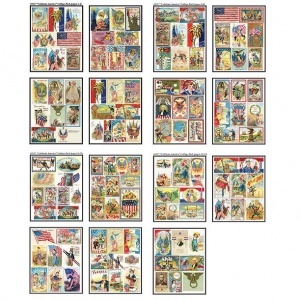 Collage pack images and papers can be used individually or layered in hand-made books, scrapbooks, journals, artist trading cards, collage work and altered art. Paper is sized 8.5 x 11 inches (21.5 x 28cm).